We're just a week away from Christmas and many schools around the world have just a few more days before the holiday break begins! During these last few days, many classrooms take some time to teach about the many December holidays and traditions from around the world. Here are a few ways to incorporate virtual reality into those lessons! Google Expeditions is a free virtual reality app designed for classrooms. It's available for both iOS and Android devices. It can be a guided virtual field trip experience led by either the teacher or a student and the rest of the class follows along on their own mobile devices. Or students can use the newly released self-guided mode and explore an Expedition on their own for a self-paced audio guided virtual tour. If you have iPads or iPod touches in your classroom, check out my Google Expeditions iOS User Guides for Teachers and Students! They are free to download, print, and share. For the holidays, there are five great Google Expeditions that will take your students from the White House to London and even to the home of Kris Kringle! 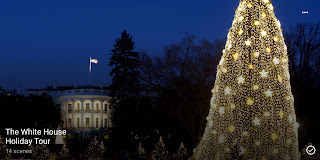 Take a stroll through the White House and take a look at this year's holiday decorations. 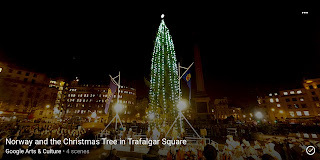 Every year since 1947, the city of Oslo, Norway have given a special gift to London, England—a Christmas Tree. The gift is a mark of Norway’s gratitude for Britain’s support during World War II. Christmas lights have a long history. The Christmas tree decorated with wax candles and ornaments has its origins in 16th century Germany. On this yuletide Expedition, we’ll stroll the streets of London’s West End to get a look at some spectacular Christmas lights. Join us as we explain Santa...using science! 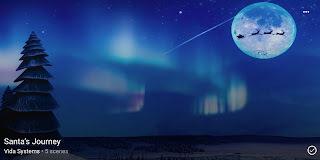 Although not celebrated as much nowadays, during Victorian times and in previous centuries, Twelfth Night, the last night of the Christmas season, was one of the biggest feast days of the winter holidays. Join this Expedition to the Charles Dickens Museum and take part in some of the family cheer. Interested in learning more about Google Expeditions? Visit the Official Google Expeditions List for updated information on scene titles, locations, descriptions, and lesson plans. 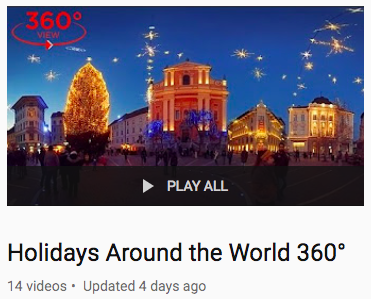 YouTube is also a great place to find amazing 360° video from around the world! I've created a playlist of classroom safe YouTube 360° videos that your students can watch to learn about how different holidays in December are celebrated all over the world. These videos will have your students traveling to the White House, Italy, Disneyland, New York City, Tel-Aviv, Slovenia, and more! tap on the Cardboard Viewer icon in the bottom right corner for 3D/VR mode! 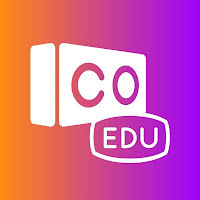 CoSpaces Edu is an amazing 3D design tool for the classroom. With either a browser or the mobile tablet app, students can create their own virtual 3D scenes and then watch them and share them in virtual reality! Last year, Michael Drezek (@m_drez) shared a really cool project idea on Twitter for CoSpaces. His teachers and students created 3D scenes depicting their favorite family Christmas traditions. Check out one of them below: Tree Farm Tradition. Install the CoSpaces Edu mobile app (iOS | Android). Then visit one of the links above in your mobile browser. You can then watch it in 3D/VR on your mobile device! Astrid Hulseboch (@astridvenezia), a teacher from Italy, is also doing amazing student projects with CoSpaces. She did a similar project with students and CoSpaces. Check out her project page here (in Italian). Thinglink is another one of my favorite creation tools for both students and teachers! They have a Virtual Reality Editor that is one of the easiest to use! Check out some of the examples below and if you're interested in learning more about Thinglink, I created a 4-part blog series back in March 2017. 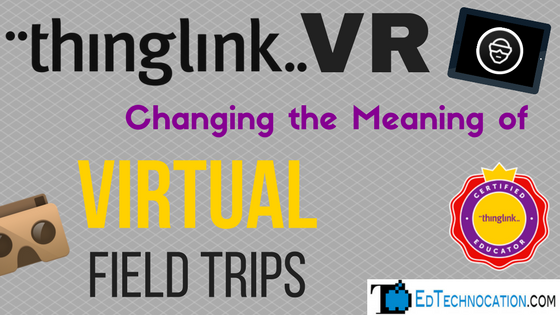 It starts here with Part 1: Thinglink is Bringing VR to Every Classroom. 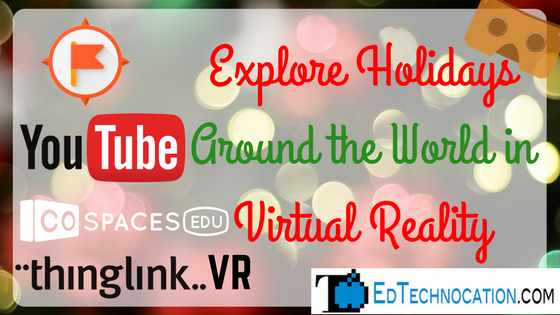 I found some great examples of Thinglink VR projects created by teachers that would be very useful for a lesson on holidays around the world. If you're adventurous enough to have students create their own Thinglink VR experiences, a few of these projects can be remixed! Christmas Wonderland at HISD - this office space is REALLY into Christmas! Santa has left presents to Thinglink R&D Team - a fun Christmas experience! This Thinglink VR project, created by educator Astrid Hulsebosch, also combines CoSpaces projects! Virtual Reality is a fascinating way to travel using nothing more than the power of technology. With a headset and motion tracking, VR lets you look around a virtual space as if you're actually there. Very helpful information.Thank you for sharing.